Shloime Gertner, who just this past year released the hit album “Vehiskin” has just is now out with a brand new single. 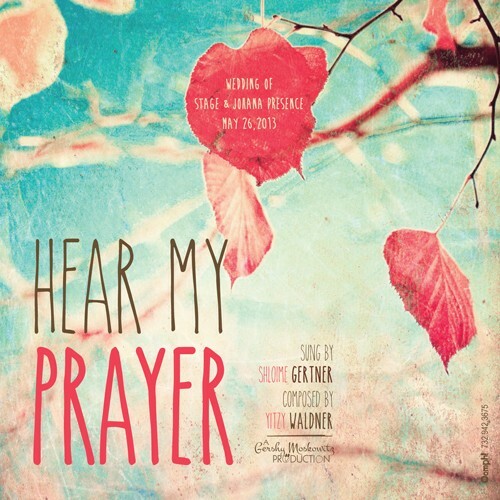 This beautiful all new song, titled “Hear My Prayer” was recorded and composed in the honor of the wedding of Stage and Johana Presence. The song was composed by the very talented Yitzy Waldner who brings an incredible energy to this magnificent song. Many who had the privilege of hearing this song in advance of its release have been blown away by not just the powerful melody but the incredible and timely message the song delivers. The wedding was held in NY, on May 26, at The View on Hudson. Mr. Presence is a close friend of Shloime’s and the meaningful and touching words were specially chosen for this important celebration. Stage is well known in the world of music and philanthropy. This all new single is available through MostlyMusic.com for just .99 cents. Included is this 45 second preview of the song. Please purchase the single here.